Step-by-step illustrated instructions show children how to grow flowers, herbs and food such as sunflowers, lettuce and even potatoes. A wonderful introduction to gardening and where food comes from. 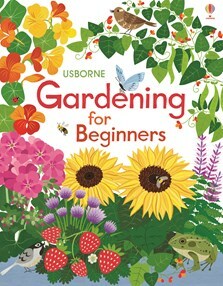 With internet links to websites with more gardening tips and ideas via the Usborne Quicklinks website. This beautifully produced ringbound volume is the ideal introduction to growing things - and the beauty of it is you don't need a garden as all the activities require only a variety of pots and containers. Another gem in Usborne’s brilliant collection of educational yet appealing books for kids. In fact, it is rather handy for adults with no clue too. There are simple, step-by-step instructions to growing flowers or food – and you don’t need a garden to use it, either, as there are plenty of ideas for containers or window sills . Perfect for budding green-fingered kids or indeed to get kids enthused in discovering how plants grow - and where food comes from - by growing their own fruit and vegetables.